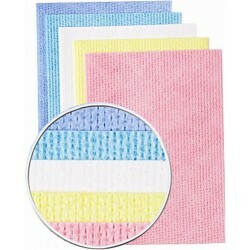 A range of cleaning cloths available in colour coded options for the food industry. This is just a selection of our cloths available, please contact us for other options. Available in Light, medium and heavy weights. Abrasive qualities help to remove stubborn stains.. Cost effective disposable wipes.Pack of 50 absorbent wipesAvaiable in 4 colours..
Hand Sanitiser Wipes (200 Wipes). Hand sanitising wipe with antibacterial and anti fungal action - e..
Portwest IW30 Heavy Duty Hand Wipes to quickly and effectively remove wet paint, oil, grease, grim..